I love outdoor living... even in January. and we spent most evenings outside during the summer months. it is a perfect setting for evening dining in the fresh air. 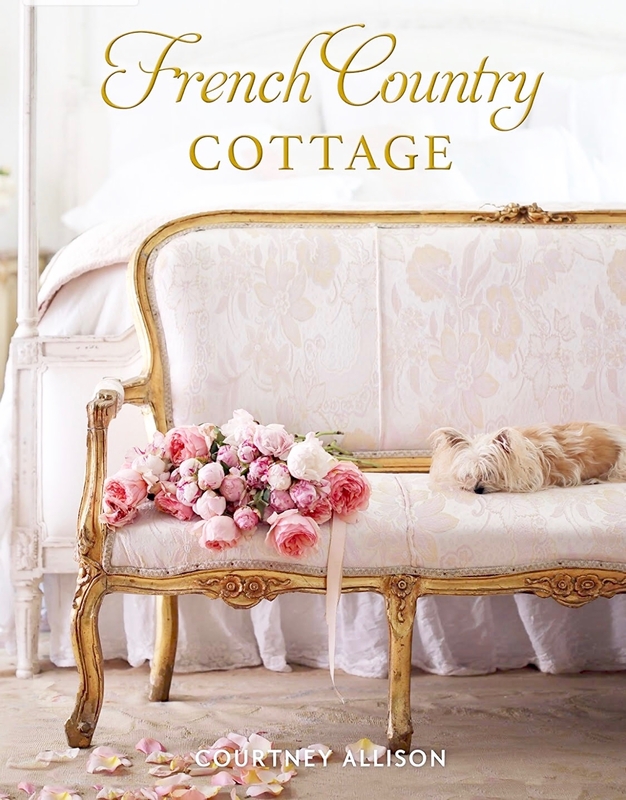 One that incorporates vintage flea finds and newly found treasures. and this drop cloth charmer was perfect. and pulled it out for my peonies post the other day. I had questions about it so sharing a bit more today. I used 2 drop cloths that I found at Lowes. Some of them are scratchy and stiff- these are not. and cut aprox. 14" off the drop cloth edging all around. to create a soft loose ruffled look. and then sewed the ruffle piece to it. I love the extra fabric draped on each of the corners. something beautiful, friendly & welcoming. unless you don't mind the wrinkly look. in the dining room and is also perfect for the table outdoors as well. of mis-matched silver over the summer and found some beauties. 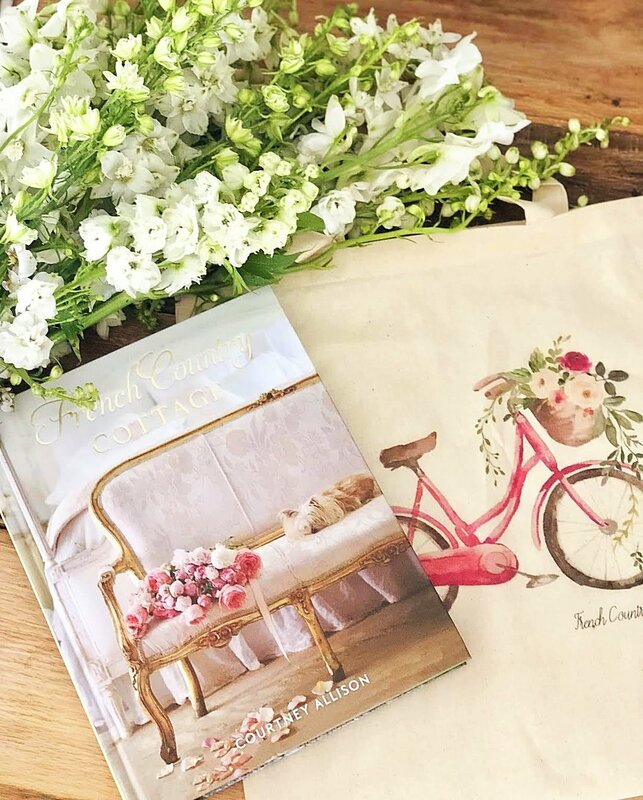 My favorites are old monogrammed and intricate patterned pieces. Some feel a bit regal and are perfect for adding a little elegance. vintage inspired carriage house lanterns. with a simple ruffled drop cloth table linen. So whose coming over for dinner? If I lived closer, I'd be there Courtney. Beautiful outdoor dining space. I love vintage silver pieces too. I picked up a bunch at an estate sale. They add so much to a tablescape. Beautiful Courtney! I love those lanterns!! Totally agree on the outdoor spaces! Love your chalk frame! 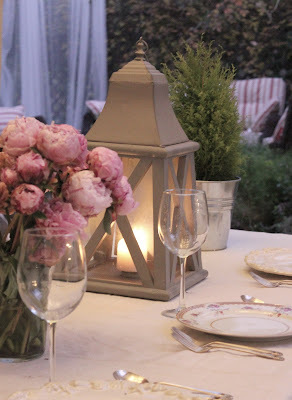 It is a very inviting place to have dinner-love the lanterns,the tablecloth and the peonies!It will be a long time before we ate our meals outdoors again. That is so beautiful!!! It turned out great! Just lovely, Courtney! I love the tablecloth and your table setting. That is one thing I envy about your area of the country ~ having your outdoor areas really be a part of your home all year long. I'll be right over! Man, I thought these photos were from a magazine! The should be in one. Stunning!! I'm freezing here in ma! Courtney, you remind me of my friend Barbara: She always looks for a reason to eat outdoors, and she has an area almost as lovely as yours! I love the vintage silver and the carriage house lanterns best. Your table is so, so romantic and pretty! These shots are sensational, Courtney! I can't take my eyes off of the one in front of that fabulous blackboard in the dining room. But all the photos have great ambience. What a treat! Lovely! It's just the ticket for dining outdoors (in May or June, here). I also want to thank you for sending so many wonderful new friends to my blog via your linky parties--I have met some great folks! I'll be right over! I'm so in love with your tablecloth. I can't believe you made that beauty from drop cloths! Oh, I will be right over. Everything is so pretty. Love your vintage silver. Oh, I love the tablecloth and the lanterns. I am a big fan of outdoor dinning also, here in Fl. we get to do a lot of it as well! Beautiful table, Courtney !! 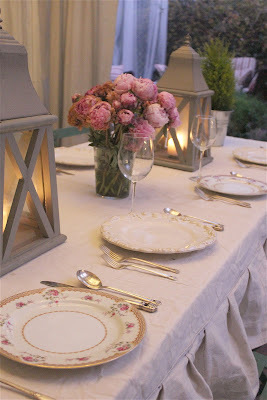 I love the lanterns ... the peonies ... and the tablecloth is awesome !! Always so inspiring !! Whaaah - I want to move to CA. Some day but in the meantime I can live vicariously through you! Love the mismatched silver. Hi Courtney ... love the tablecloth. May need to make one for my dining table. I did no-sew drapes in the living room and love them. Love the outdoor setting too. Audrey Z. at Timeless Treasures. Courtney, what a beautiful setting! Everything looks gorgeous! The linens, the silver, the flowers...they're all just stunning! Court, this is outdoor living at it's best!!! You h ave inspired me to finish my back porch project! It's been about 70 degrees here this winter, and outside living is exactly what we need! Your table is beautiful! 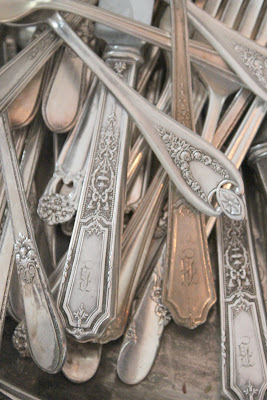 I love vintage china and silverware.... and have an extensive collection of both. I keep my dining table set (decorated) most of the time and frequently use mis-matched pieces. I LOVE the idea of using mis-matched silverware. Great idea! Thank you for inspiring us. All you created fascinated me! Even the title logo caught my eyes!!!! Lovely lovely. I must share this with my friends! I'm on my way! 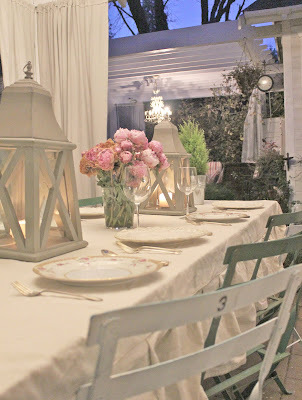 You've created such a beautiful outdoor space and I absolutely adore your dropcloth table cover. Gorg.! I wish I was coming over for dinner! It all looks so lovely and charming Courtney and I'm only slightly jealous that you can do anything outside right now. It is soooo cold here! The beauty here always feeds my soul. It takes me so long to get through a post because there's so much to see in each picture. I love all the variety of silver you use. Love the lanterns. The table looks so pretty. I can't wait to see the entire outdoor space with the panels in place. I buy the same ones you do, or at least was lucky to for my first time using drop cloths for my office drapery panels. I washed them first and then hung them and they were super soft. So jealous of that California weather right now! The setting is just perfect. I'll be there! I'll hop on a plane for dinner out there any day. Your outdoor dining looks delightful, Courtney! Did I spot dropcloth drapes hanging in the background out there too? I love how you explained how you made the tablecloth. I agree Lowes has some great dropcloths. Love your outdoor tablescape and tablecloth! Thanks for sharing! Gorgeous tabelcloth and outdoor area Courtney. I have a thing for monogrammed cutlery too... I always wonder about its history. Count me in! How I'd love to be able to eat outside year round! I love that tablecloth -- thanks for the info. on how you created it! Che dire.Sono rimasta a bocca aperta per tutto quello che vedo nel tuo blog.COMPLIMENTI!!!!!! Ti metto subito tra i miei preferiti. I am kicking myself for just the other day throwing out my dropcloths! Ugh! I LOVE the tablecloth idea...dang it, now I have to go get more dropcloths! Simply lovely! Wow! This is beautiful. 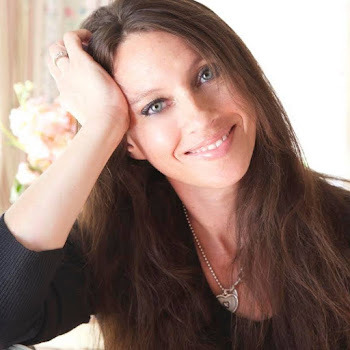 Just found your blog and your home and ideas are gorgeous. I am now a follower. It's simply beautiful! I love sewing with dropcloths and have made pillows and runners, but never a whole tablecloth! I also buy mine at Lowes and find washing and drying them softens them up before I sew. Eating outdoors is a long way off for us, so thanks for sharing! I love the idea of outdoor living in January! We need to do that with a lot of down duvets and a roaring fire since the temps tend to drop below -20 C or -13F....but there is nothing quite like it. Once again, everything looks lovely chez toi!! So beautiful! Outdoor living in January is what I miss about living in California! Your table is gorgeous! The table is so pretty with your gorgeous ruffled tablecloth, beautiful! 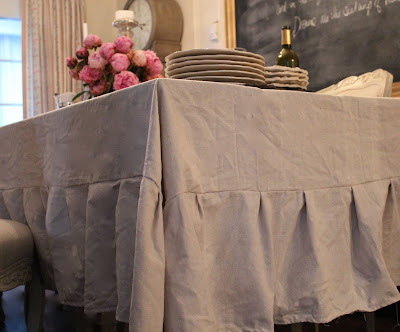 Drop cloth & ruffles... you're my kinda gal... it's adorably sweet! Beautiful - Boy, I want that chalkboard more every time I see it . . . I am definitely going to have to try and make the drop cloth tablecloth. It is so fabulous in that fabric and it looks so casual yet chic! What a fun idea to get the inexpensive silver and mix and match. Perfect for the setting. I can't wait to see the finished place! I would love to be able to enjoy the out of doors year round! On my bucket list for sure!!!! Oh, how I wish I could be sitting around outside right now. We have snow on the ground which is wonderful but not so great for spending much time outdoors. The table is gorgeous! I love the collected silver pieces. This is lovely. How lucky you are to be able to enjoy the outdoors like this, even in January. Lovely tablecloth! It has inspired me but can I ask where does the 2nd cloth you mention come into play? Once you gather the cut off piece does it not go all the way around and you need to cut a second? do you happen to remember the brand on the drop cloths from Lowes? Thanks for any advice! Saw your post last night on wow us wednesday...have been thinking about your beautiful outdoor table...thought it only polite to tell you how much I LOved it...I also am a HUge fan of the meager drop cloth. 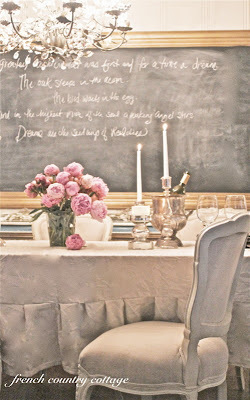 Your tablecloth and settings in front of the chalkboard...pure perfection!!! Thank so for the inspiration...Kudos my dear! 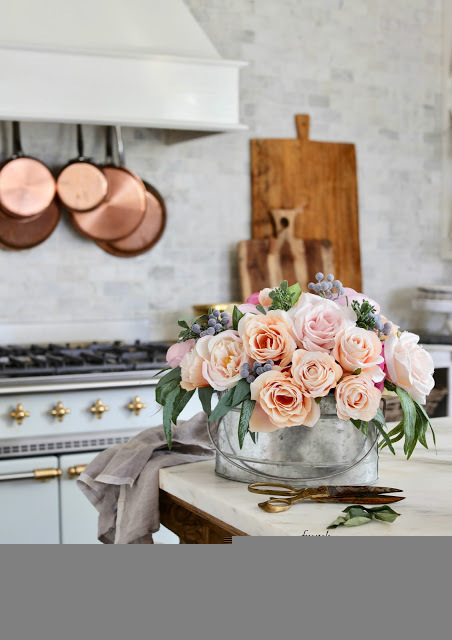 LoVe the CONTRAST of the Chandelier/Chalkboard/RoSes!*!*! a simple table but really a simply beautiful table and setting and EVERYTHING! so well done! This is just so dreamy and beautiful. 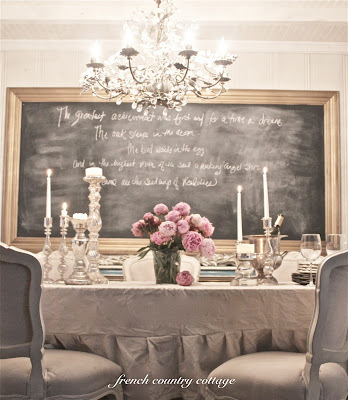 Love the tablecloth, the chalkboard, the silver..well, all of it! EVERTHING about this entry speaks to me! I love using drop cloths too....your cloth is wonderful! Beautiful as always! I wish I could figure out box pleats and ruffles! Loving the drop cloth tablecloth. The ruffles are just perfect and the table setting is beautiful! You always inspire me -- and what beautiful china!